Pop veteran Matthew Sweet shines through with genius on his latest release, Time Capsule, a best of album covering a decade (90-2000) of amazing musical creations and genuine pop hits that should have been even bigger than they were. "Girlfriend", "Sick Of Myself", "The Ugly Truth", and "Where You Get Love" have never sounded better. The sharp, crunchy guitars, the bouncy, but firm rhythms, and the hypnotic vocals, not to mention quirky keyboards, dazzle as Matthew Sweet delivers hit after hit without a dud. A true pop aficionado, Sweet will go down in musical history as a man able to turn the simplest of power-pop numbers into catchy, addictive, and filling masterpieces that only grow and grow with time. 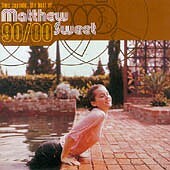 Here's hoping in another twenty years everyone and his or her mother wants to be a Matthew Sweet clone. I'll give this an A+.